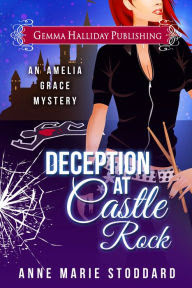 Author Anne Marie Stoddard is joining us this week with an excerpt and giveaway of Deception at Castle Rock, the second book in her well-reviewed Amelia Grace mystery series. You can pick it up for 99 cents this week! See below for details on how to win a signed copy of Deception at Castle Rock! After making a quick run through the drive-thru at Java Joy, I sped over to Castle Rock and parked in the gravel along the side of the building, closest to the back entrance. Grabbing one of the chocolate raspberry scones from the bag, I nibbled the pastry as I made my way toward the back door. To reach the rear entrance of the venue, I had to walk around Royal Flush’s black tour bus, which was now parked behind Castle Rock. Kat and I agreed to let the band keep the over-sized vehicle out back until they left on Sunday for their next tour stop. As I rounded the bus, I stopped short, frowning at the passenger’s side door. Why is the bus open? When I’d left Castle Rock the night before, Kat was about to shuttle the guys, Ginger, and Suzie back to their hotel. Maybe they forgot to close up the bus after loading their equipment. No way, I thought, shaking my head. The guys wouldn’t leave their instruments in an unlocked vehicle overnight. A sense of unease crept over me as I approached the open door. What if a bum had wandered aboard? Or a thief? Don’t be ridiculous. I shook it off and stepped up onto the small set of stairs that led inside the tour bus. I was immediately overwhelmed by a cloying, coppery odor. “What is that?” I asked aloud, wrinkling my nose. The inside of the bus was dark. I squinted, waiting for my eyes to adjust. “Hello?” I called. Either my imagination was playing some horror movie-style tricks on me, or someone—or some thing—responded with a muffled groan. Fear pricked at the hairs on my arms and neck. The noise had come from the back of the bus. Was someone back there? There was a fleeting moment where I almost turned and bolted, figuring it would be safer to wait and inspect the bus when someone else had arrived, like Emmett. Or Reese. Or maybe a SWAT team. Then the low moaning noise sounded again, and I sucked in a breath. Something about it sounded oddly familiar. Curiosity got the better of me, and I began to move deeper into the bus’s interior. I quietly inched my way past the black leather benches that lined the walls of the vehicle, and I sidestepped around the table that stuck out from the little breakfast nook. Digging into my purse, I produced a small can of pepper spray and a key chain that held a mini-flashlight. One finger hovered over the trigger of the can ready to unleash a cloud of pepper spray on anything that moved. Before I could turn on the flashlight, my foot connected with something solid in the middle of the floor. With a startled cry, I dropped the can and the keychain as I toppled down, landing on something cold and sticky. The coppery smell grew stronger, and a feeling of nausea rolled over me. I fumbled around on the floor for my flashlight, but instead my fingers closed over something hard and smooth. I ran my hand around the object, trying to identify it. A shoe? My pinky grazed against the cold metal of the mini-flashlight, and I reached for it. I clicked it on, illuminating the space in front of me. A shock wave of horror slammed through me. I screamed and scrambled to my feet, backing quickly toward the bus’s entrance. The hard object I’d felt before was a boot, all right—and it was still on the foot of Sid Malone’s corpse. Anne Marie Stoddard is an Amazon Movers and Shakers and Amazon top 100 Mystery & Suspense author who writes funny rock n' roll-themed cozy mysteries with an edge.After studying Music Business at the University of Georgia, she worked for several music venues, radio stations, and large festivals before trading in her backstage pass for a pen and paper (Okay, so she might have kept the pass...). Her debut novel, Murder at Castle Rock, was the winner of the 2012 AJC Decatur Book Festival & BookLogix Publishing Services, Inc. Writing Contest, and the 2013 Book Junkie's Choice Award Winner for Best Debut Fiction Novel. It was also a finalist for Best Mystery/Thriller in the 2014 RONE Awards. Deception at Castle Rock was a finalist in the 2016 RONE Awards for Best Mystery. Aside from all things music and books, Anne Marie loves college football, Starbucks iced coffee, red wine, and anything pumpkin-flavored. She is a member of Sisters in Crime and the Sisters in Crime Guppies chapter. Anne Marie is currently hard at work on several new projects. 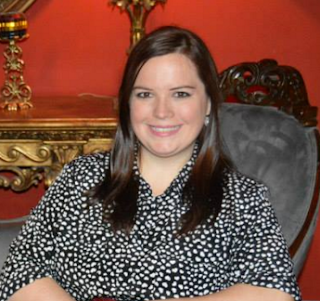 Visit www.amstoddardbooks.com to connect with Anne Marie and learn more about her upcoming books! Please comment below to enter the giveaway! Share this post on social media additional entries, and don't forget to comment and let us know you did so! Please Note: If you are commenting anonymously, please leave your full Facebook name or email address so that we may contact you if you are the winner. Comment before midnight on 7/18/16 to enter. US delivery only. Winners will be chosen via random number generator next week! Shared on Twitter and Pinterest. Thank you for sharing! You can't go wrong with a cozy mystery with a rock and roll theme. Great description! I was getting tense just reading that. Thank you. I'm excited. Great post! :) I loved the first book when I read it a while back. Off to pick up the second one now. Thank you so much for sharing! This books sounds so spell binding. I must add it to my TBR list. So excited for this opportunity! I'm looking forward to reading!! Sounds interesting. Going to check out the other books in this series. Thanks for the opportunity. And thank you for stopping by and checking it out!! This series is new to me, but it sounds like a great read. This is a new author to me and I would really enjoy reading "Deception at Castle Rock". Book sounds like a great read. Thanks for the chance. Liked and shared on Facebook. Good luck with your entries and thank you for sharing!! Although I am familiar with the author, this is a new series to me. I love the excerpt... Why is it they always search alone? Thank you for the opportunity & the excerpt. thanks for the chance to win! great cover! It is a terrific cover! I like mysteries and I like series. I have not read the first book in the series but I want to. The story sounds really good according to the review. Thank you for the opportunity. I haven't read any of these books but they sound great. Thanks for the excerpt. Please enter me in the contest. That's a good start. I'd like to read the rest.